The 2016–17 Eerste Divisie, known as Jupiler League for sponsorship reasons, is the sixty-first season of Eerste Divisie since its establishment in 1955. It began in August 2016 with the first matches of the season and will end in May 2017 with the returns of the finals of the promotion/relegation play-offs, involving also the 16th- and 17th-placed teams from the 2016–17 Eredivisie. The fixtures were announced on 14 June 2016. A total of 20 teams are taking part in the league. 2015–16 Eerste Divisie champion Sparta Rotterdam gained promotion to the Eredivisie, and was replaced by Cambuur, that finished last in the 2015–16 Eredivisie. Go Ahead Eagles won the post-season playoff, and are replaced in the 2016–17 Eerste Divisie by De Graafschap. Achilles '29 was relegated, and Jong FC Utrecht joined the league. ^ a b c Reserves teams cannot be promoted and cannot participate in the promotion play-offs. 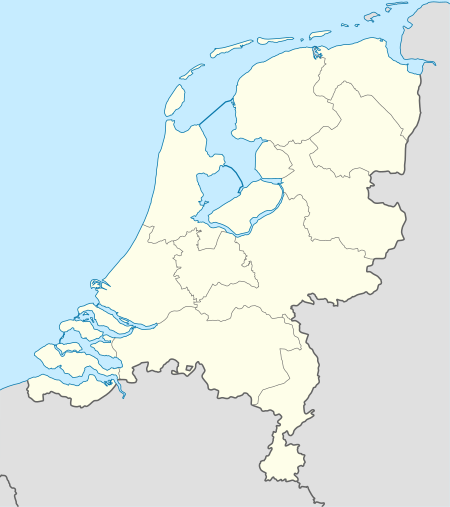 ^ a b Ten teams, two from the Eredivisie and eight from the Eerste Divisie, play for two spots in the 2017–18 Eredivisie, the remaining eight teams play in the 2017–18 Eerste Divisie. The season is subdivided in periods consisting of games 1–9, 10–18, 19–27 and 28–36. The top finisher in each period (that has not won a previous period) is a period winner and qualifies for the promotion play-offs first round even if they finish the season outside of the top nine. ^ Fortuna Sittard were deducted three points for an outstanding bill owed to KNVB. On 10 April 2017 Fortuna Sittard were deducted another 6 points for not meeting financial targets. ^ Achilles '29 were deducted three points for repeatedly not meeting financial requirements. The numbers 16 and 17 from the 2016–17 Eredivisie, 4 (substitute) period winners of the 2016–17 Eerste Divisie, as well as the 4 otherwise highest ranked teams of the 2016–17 Eerste Divisie, making a total of 10 teams, decide in a 3-round knockout system which 2 teams will play next season in the 2017–18 Eredivisie. The remaining 8 teams will play next season in the 2017–18 Eerste Divisie. Reserves teams are excluded from participating. ^ "EREDIVISIESEIZOEN BEGINT IN NIJMEGEN". www.eredivisie.nl. 14 June 2016. Retrieved 14 June 2016. ^ "Beroepscommissie straft teleurgesteld Fortuna Sittard met aftrek drie punten" [Appeals body punishes disappointed Fortuna Sittard with three points deduction] (in Dutch). Fortuna Sittard. 18 September 2016. Retrieved 8 November 2016. ^ "Fortuna Sittard krijgt 6 punten in mindering" [Fortuna Sittard gets deducted 6 points] (in Dutch). KNVB. 10 April 2017. Retrieved 10 April 2017. ^ "Beroepscommissie: Achilles '29 krijgt drie punten in mindering" [Appeals body: Achilles '29 receives three points deduction] (in Dutch). KNVB. 5 May 2017. Retrieved 5 May 2017. ^ De Graafschap was forced to play the home match of 21 October 2016 against Helmond Sport in an empty stadion. Reason for this was misconduct of the supporters of De Graafschap in the 2015–16 play-off match against Go Ahead Eagles.